Google’s stricter and stricter search engine algorithm updates have got us all scared out of our minds to practice any kind of back linking that goes beyond the occasional reference in a guest post author bio. It’s no wonder: countless sites who were performing well in SEO and raking in the big bucks as a result literally lost their traffic over night (along with their incomes) and haven’t gotten it back. And no one wants that to happen to them again. But for newbie online marketers, seeing the surge in traffic after a quality guest post with a backlink makes chasing a backlink-building strategy all the more tempting—especially if they feel they can get away with it for a while. While some backlinking is okay and won’t get your site punished, it seems the moment you start to focus on it as a strategy for traffic is the moment your site rankings start to plummet and you lose all that valuable rankings you worked so hard to earn. So now we avoid backlinks like the plague. 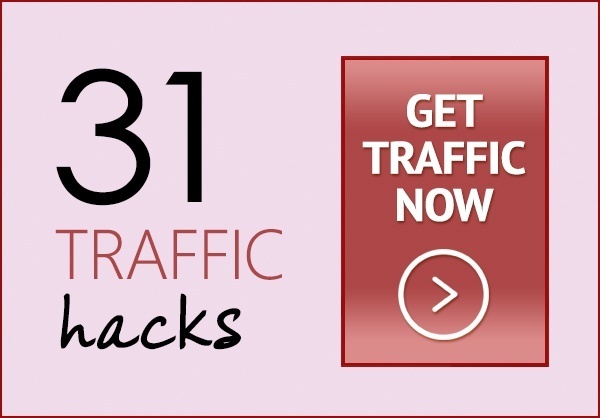 Fortunately, there are three solid ways you can build your organic traffic numbers and your search ranking results without risking any consequences that come with the black hat SEO practices search engines frown on. To put it simply, schema markup is code you place on your landing pages so when they show up in search results, the search engine displays the information that’s most relevant, increasing your click through rate. Here’s how it can help your web pages stand out. 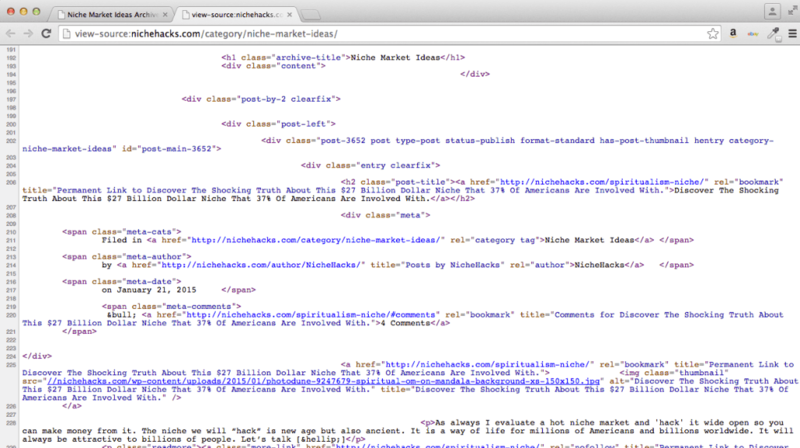 Be honest, the ones with schema markup are the ones more likely to get your clicks, right? And they’d be more likely to actually show up in search results too. According to Searchmetrics, more than one-third of the sites that show up in Google rankings use some sort of schema markup, but of all the websites on the internet, only 0.3% use Google-approved schema markup. This is how it works: when you add schema markup around a word or a phrase, it tells the search engine what those words or phrases mean. Otherwise, when a search engine parses through your article, it just acknowledges the existence of those words, not their meaning. Schema markup can help you define your location, your pricing, user reviews, and the main topic of your website: all factors that would help a user know what you’re all about before they click through to your site. For an article, you can markup things like title, author, publication date, main image, url, and a featured section. Google has an easy-to-follow Structured Data Markup Helper that leads you step-by-step through the schema markup process based on the type of items you want to boost your search engine rankings on. If you’ve got a niche site you’ve been running for a while that saw some negative fall out from one or a few of Google’s search algorithm updates, all hope is not lost—even if you were involved in black hat backlink building. The people working at Google understand that you might have accidentally hired a shady agency to take care of your site marketing, or that you might have just been building links in happy ignorance only to be shocked to find out that what you were doing was wrong. For these kinds of cases, they’ve created a reconsideration process that gives you a chance to prove yourself and show that your website offers quality content without spamming the internet. First, you need to figure out which manual actions Google has taken against your site in relation to your accidentally excessive back links by checking it out in your webmaster tools. Once you’ve got that down, remove as many of your excessive, non-quality backlinks as you possibly can. If you can’t remove them, you need to at least disavow them. Once that’s done, put together some examples of how you’ve removed all the rogue links and stopped black hat SEO activity. If you hired a shady agency by mistake, tell Google the full story and let them know that you’ve hired a better agency or how you’re taking care of it yourself. If you were the one to blame, own up to it, but tell them the techniques you’re sticking to now to promote your site. If you put in the required elbow grease to undo your past SEO mistakes and are honest in your reconsideration note, there’s no reason Google wouldn’t grant your request and take away your manual actions, giving you back the boost of traffic you need to make your site more successful. If content is king, then distribution is queen: it might be an over-stated mantra, but it’s true. As a marketing consultant, I see far too many content producers broadcast their content over a handful of social media channels with false hopes that that’s all it takes to draw in new, quality audience members. The need for quality, engaging content is a given. But unfortunately, all too many niche marketers ignore or skim over the need for in-depth, strategic distribution of their current and past content as a key strategy for building quality, information-hungry traffic to their sites. After all, what good does it do to put in hours creating killer content if you only get traffic from it for a week after it publishes? It does some good, to be certain, but the potential is nearly limitless. But to reach those limitless possibilities of exponential shares and free, incoming traffic, you’ve got to have a planned, strategic content distribution plan that tells you what to post: where and when. But distribution includes far more than social media. It includes guest blogging, inter-linking your own website, your email list, and even events. A good way to keep yourself on track with content distribution is by using a spreadsheet tracker so you can plan which pieces of content you’ll share where, and when. Tracking this on a weekly or monthly basis keeps you accountable to yourself and lets you plan in advance what the best pieces of content to share will be in correlation to your marketing strategies and product launches. As a niche marketer, boosting your quality organic traffic without backlinks is all about planning and strategy. What are some of the best ways you’ve found to boost your organic traffic without working on backlinks? When carrying out niche research it's also important to do keyword research in order to see what your target audience are searching for online. It's not enough just to target broad keywords with vague relevance to what you are offering you need to look to target specific keywords that will actually convert into sales. One of the best ways to do this is to target "buyer keywords" or keywords that show buyer intent, i.e. that someone is in the phase of being ready to buy and aren't just browsing or vaguely interested. The most obvious ones are search phrases that include "buy", "review", "discount", "cheap" and so on but actually there are hundreds more search terms that show buyer intent that most people just never think of. 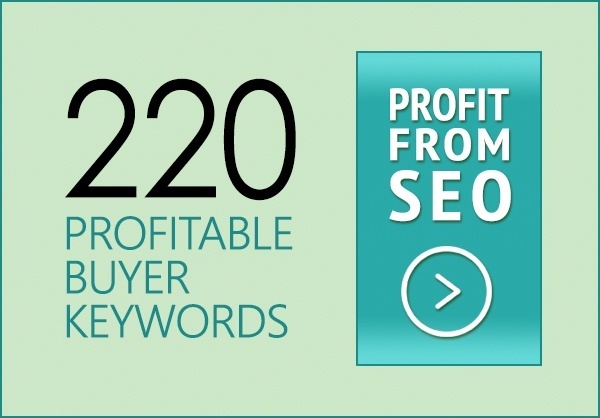 Below I share a buyer keyword list of 220 red hot keywords with buyers intent. 220 keywords that people use when they are close to making a buying decision - use these in your content to increase conversions and make more sales. The keyword phrases you should use on your site to convert visitors into buyers. 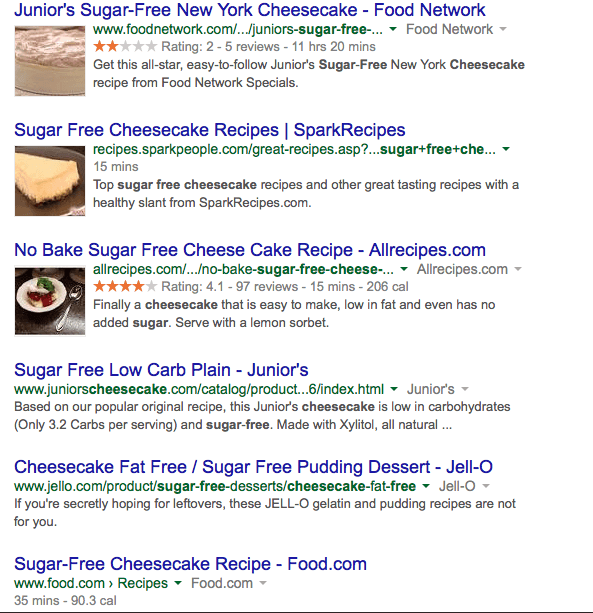 How to avoid using vague keywords with no buyer intent that people use when just browsing for information. Hopefully this has given you some good buyer keyword ideas that you can use on your sites. Most of these are not actively targeted by 90% of internet marketers because they focus on the obvious buyer intent search terms like "buy", "review" and "cheap". Go hunting and you'll find some golden nugget keywords you can dominate. I don't know about you, but every time I have to come up with a list of keywords for a content campaign using only my brain, the results are pretty lame. Needless to say, it usually doesn't take long for me to realize that I've got to start looking elsewhere to see what keywords other competitors are having success with or to see what words and phrases the target audiences actually uses when they talk online. To top it off, I usually don't work with companies or projects that are ready to buy into Google's AdWords tool right away, preferring to beef up their organic SEO to see what truly works before dropping their hard-earned bucks on advertising. And as a solopreneur niche site owner myself, this is the approach I take in my own keyword-building strategies. I want my new site to be a huge success and all, but the fact that it isn't yielding five figures per month yet means I've got to watch where I spend my money... which is not going to be on keyword research. Fortunately, there's loads of places online where you can uncover the truly valuable keywords you'll want to integrate into your content strategy so you can beef up your organic traffic. Some sources are great for potential customers doing research-based searches, and others will provide you with those golden keywords that belong to searchers who are ready to buy and already have their credit cards out of their wallets. It'll take you all week and the point is to create a keyword strategy that's actionable, not one that freezes you in your tracks. When you go to Google’s home page, or even from a browser’s search bar, Google starts to automatically fill in what it thinks you want to know almost instantly after you start typing. The idea is to help users search faster and get to the information they need quicker. By starting with a single keyword that’s central to your site’s mission, you can get an entire list of long-tail keyword phrases that have a higher purchase intent than phrases you could have guessed on your own. 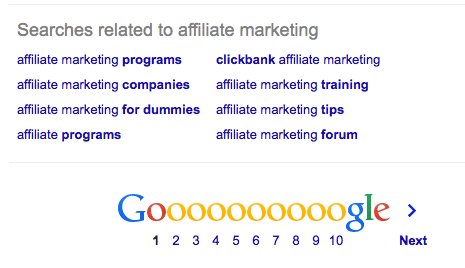 After a plain search for affiliate marketing, Google's results tell you that most searchers want to learn how to do it. While you’re checking out what kind of gold nuggets Google’s auto-complete feature has to offer, scroll down to the bottom of the page to see what other long-tail keywords people are using in conjunction to the one you’ve just typed in to find the information you’re looking for. These will help you expand your thinking, but they may also serve as an important red flag so you can know when you’re beating down the wrong path. If none of the related searches relate to the topic or goals of your niche site, you might want to consider another direction in your long-tail keyword strategy. Related searches give you more in-depth, longer-tail keyword options than you might guess on your own. In this example, starting a phrase with "Clickbank" could open up another world of keyword possibilities. The key to success is always staying one step ahead of the competition, but sometimes in order to get ahead, you need to understand what your competition is doing that’s beating you to the ground. In terms of keywords, you won’t be able to uncover their keyword strategy 100%, but you will be able to figure out the trends and long-tail terms they’re going after. 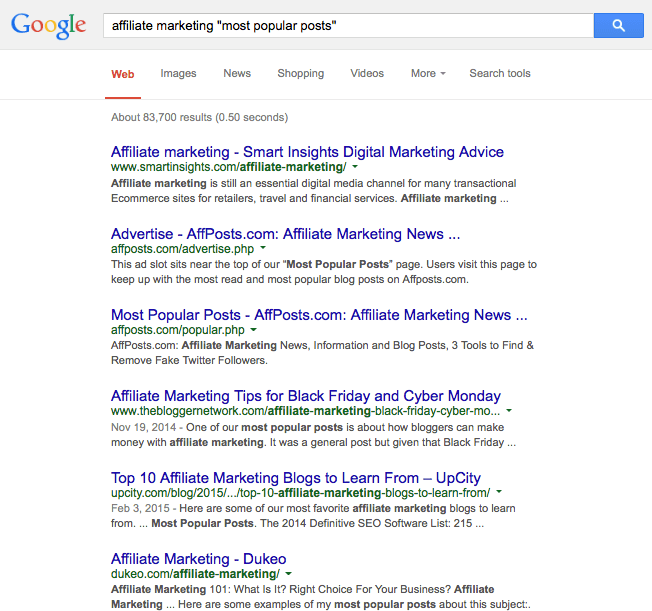 Open Chrome and type in a keyword phrase that you’d love to rank for and click on one of the first results. When the page opens, hold down “command + option + u” simultaneously (“control + alt + u” on a PC), and you’ll see the page's data pop up on the bottom of the screen or in a new tap. Hit “command + f” and search for different tags like <title>, <H1>, <H2>, or <keyword> to see what’s put between these tags. Once you’ve got an idea of keywords they're trying to highlight, skim through the content to look for long-tail variations. 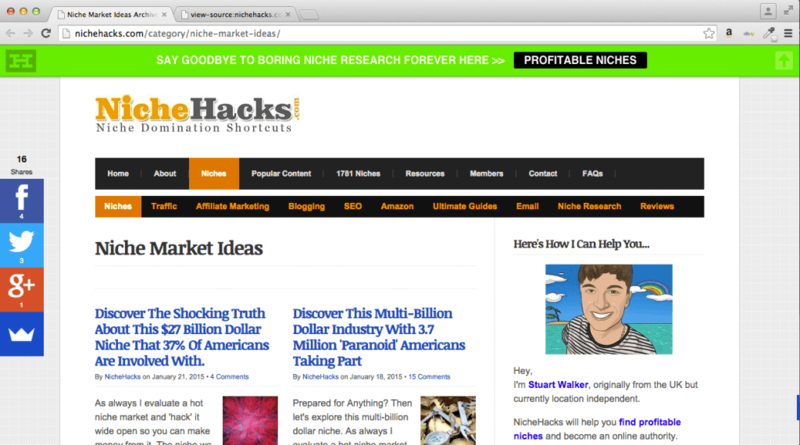 Before: NicheHack's page on Niche Market Ideas. After: The Chrome shortcut yields all kinds of information about this page. Hands-down, Amazon is the king of organic search for keywords that drive the purchase of physical goods. If you’re using your niche site to sell things people can use for themselves, give as gifts, or need for any other purpose, you’d be a fool not to troll around Amazon for a while to see what kind of SEO keyword work they’ve got going on. When you search for a specific product (you can pick anything related to your site), look for keyword patterns in the results menu in the left column, the main header and supporting text, the list of results, breadcrumbs, and items listed. Keywords related to a MacBook cover include rubberized, hard, 13-inch, keyboard, laptop, netbook, sleeves, slipcases, skins, cases, and decals. When you click on a specific product, look at the product description, what other customers bought, product ads from other sites, the top-rated reviews, and customer Q&A. From this info you can glean keyword phrases like retina display, polycarbonate material, snap-on, light-weight, rubberized plastic, transparency, silicone skin, hard shell case, and different brand names. The names listed under items purchased in conjunction with the main one give you long-tail keyword ideas that are more purchase-focused. 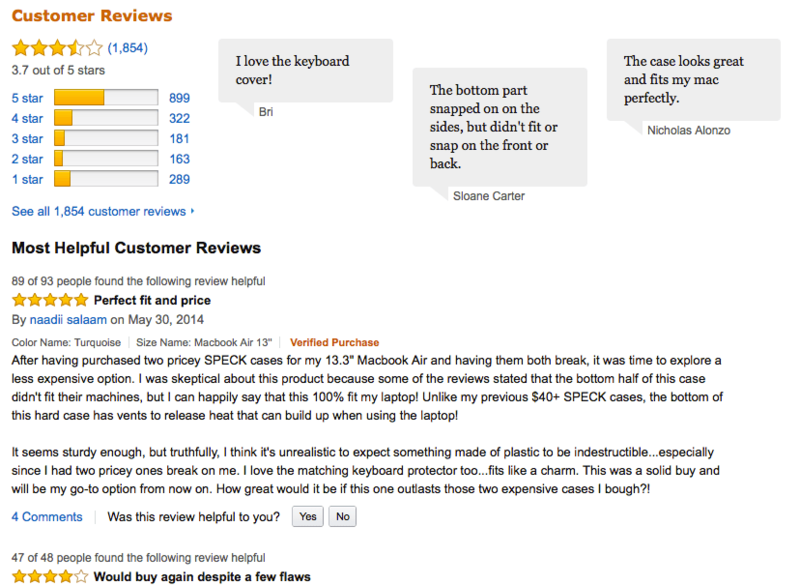 Customer reviews are a great place to find high-emotion key phrases that can boost your content. For this product, you can glean words like indestructible, SPECK, break, vents to release heat, and go-to option. eBay is not a bad runner-up to Amazon in terms of dominating online retail or creating an easily searchable online marketplace. By following the same steps you did with Amazon’s product listings, you’ll be able to find even more keyword patterns and long-tail keyword options to fill out your product descriptions and advertising strategies to get the traffic with the highest buyer intent. And the benefit of eBay in particular is that it’s a little bit less regulated than Amazon in terms of what product sellers write in their descriptions, so you’ll often come across something a little more candid than you’d expect on Amazon. 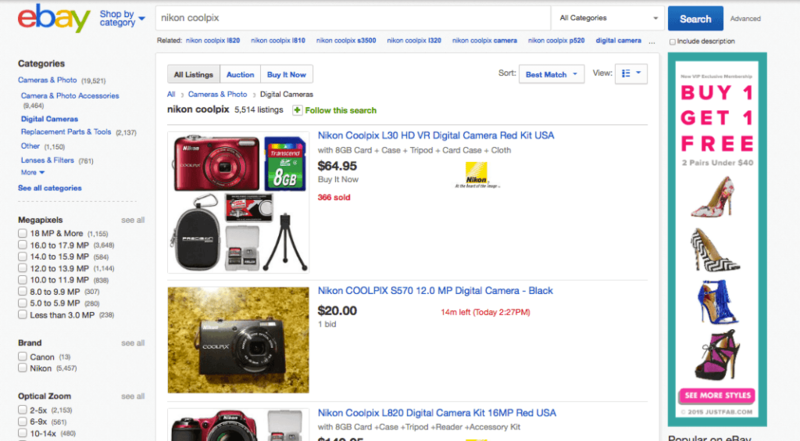 In the top listings after a simple product search on eBay, you can find keywords like digital camera, [color], 'MP' for megapixels, photo accessories, replacement parts, lenses, filters, and optical zoom. In the product listing itself, you can find differentiating keywords like S3600 HD VR, tripod, 8GB, and 2 yr warranty. The ads also sometimes give you hints like Cameta Camera, Nikon, and authorized reseller. Wikipedia is the sixth most popular website in the world, and it is #4 on Google with absolutely no paid advertising. Wikipedia has one of the best organic SEO backends on the planet, so taking an effort to mimic them with relevant, internal keyword linking is huge. If you’re in a rut and getting stuck with the same basic keyword phrases over and over again, check out Wikipedia for some relevant, linked terms in the intro paragraphs on your given subject. You’ll also get some hints from the table of contents and any other side menus on how to delve deeper into the topic at hand with linkable, effective keywords. If you're in the online advertising niche, this Wikipedia page is a gold mine to start your keyword listing from. Key phrases that literally jump out at you include online marketing, internet advertising, search engine optimization, email marketing, native advertising, web analytics, search analytics, contextual advertising, behavioral targeting, mobile advertising, and many more. Normally, people go to Yahoo Answers in desperation to find answers to their question that they weren’t able to find with a quick look around the web via a search engine. If the question and answers are relatively recent, this can be a gold mine for showing you what your target audience wants to know but isn’t finding answers for (tweet this)—and you can create the content to fix that problem. Further, when people go through the effort of creating and/or signing into an account online just to ask a question, you can bet that there’s some high emotional value attached to it, which means they’re desperate to know something, and are probably willing to spend some money for a quality solution. Typing in a common problem into Yahoo Answers is a great way to get high-relevancy, high-emotion keywords. In this search to 'get rid of a wart,' you uncover words like freezing, medicine, home remedies, permanently, facial warts, and painless treatment. Whether you offer products or business services for sale on your website, you can search the web for hot review sites on either. If you’re selling products, Amazon and eBay are gold mines. If you offer services, you might have to dig a little deeper, but reviews of different companies and service providers are still relatively easy to find. The best things to look out for are common themes in dissatisfaction and satisfaction. Why are all the five-star reviewers so thrilled and what do they keep talking about? And why are all the two-star and one-star reviewers so disappointed? What do they keep mentioning that they wish wasn’t lacking or would have made their experience with the product or service better? Borrowing this kind of sticky copy for your own on-page content will not only increase readability and conversions, but it will also help in your SEO rankings for prospective customers who like to do serious research before they make a purchase. 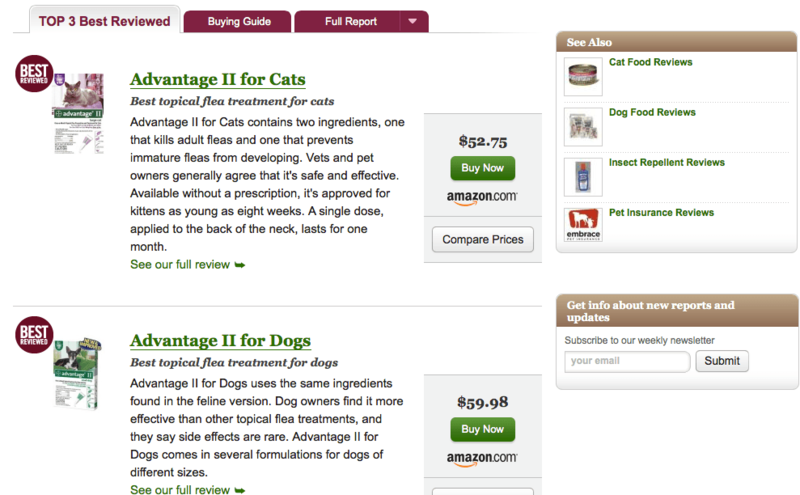 These results on Consumer Search for 'flea control reviews' show lots of flea and pet-based keywords like adult fleas, immature fleas, prescription, dose, topical flea treatments, and side effects. If you’re a small niche site, you are the customer service, sales rep, content producer, and site owner all rolled into one. But whatever your niche business setup is, there’s some real data to be uncovered in what your customer service has to deal with once someone is sold on a service, or questions sales have to answer before someone becomes convinced to buy. Look through your strings of email conversations with current and potential customers to uncover common trends in your audience’s top concerns about your product or service. If you have a sales rep or two (or even an entire team), send out a free-form questionnaire asking them to write in the most common problems and questions they deal with. The recurring phrases you see are the ones you want to latch on to. Google might have stopped handing over all the juicy data on the keyword phrases people search for to actually get to your site, but your site’s internal search bar is fair game. By looking at the list of search terms of items people want to find immediately after they get to one of your landing pages, it’s a golden ticket to improving your on-site SEO and giving your prospective customers what they want right away. You'll be able to access the search terms people use within your site under the 'Behavior' menu option in your main dashboard. While it doesn’t show you exactly what your particular audience is searching, Google Correlategoes after phrases that are the most highly correlated with whatever you type in. Some are home runs and can give you great ideas for expanding your keyword strategy, and others are just there because Correlate reads numbers rather than context. 'Single family homes for rent' may not be of much use to a weight loss niche marketer, but terms like how many calories, eat to lose, and belly fat will help you come up with some great SEO-based content ideas for your site. If your niche is in a hotly-published topic, check out some of the best-selling books that have already been written and are selling well. One of the easiest ways to do this is to look up a niche rockstar on Amazon and check out the ‘Look Inside’ Kindle preview. Make sure you devour the table of contents—it’ll give you insight into what the successful niche masterminds in your space are successfully writing on, and you can use their topic and keyword strategies as inspiration for your own content marketing. From this table of contents, a person with a make money online niche site knows that he'll need to cover Amazon affiliate marketing, Clickbank, Google Adsense, YouTube, and Kindle Publishing. In contrast, a site that specifically serves freelance workers would want to cover keyword-based topics like getting clients, prospecting tactics, repeat business, referral business, productivity, work-life balance, and streams of income. If you do a Google search for your main keyword followed by “most popular posts/sites/articles”, you’ll uncover a treasure cove of content ideas and long-tail keywords to utilize. This tip is particularly effective if you combine it with tip number three and you use Chrome to uncover the long-tail keywords embedded into titles, headlines, and sub headings—not just for your direct competitors, but for niche-related websites that share a similar audience. Ideally, you'd follow each of these links and try to glean keyword data from each of them - or from the list of sites they provide. But from the search results alone, you can see keyword phrases like digital marketing advice, ecommerce sites, Black Friday, Cyber Monday, and affiliate marketing blogs. This tool makes a word map of the most recurring phrases in a piece of content. If there's a piece of content (whether on your site or somewhere else) that you know gets a lot of traffic from organic search, you can copy and paste the content of the post into Wordle’s ‘Create” screen. What it leaves you with is a word map showing the most commonly used words within the blogfeed as a whole or that piece of content in particular. Figuring out ways to put these top-ranking words together will help you come up with some long-tail keywords that will generate more organic traffic for you. Tip: sometimes it's a little slow to work, but the results are usually worth the wait. 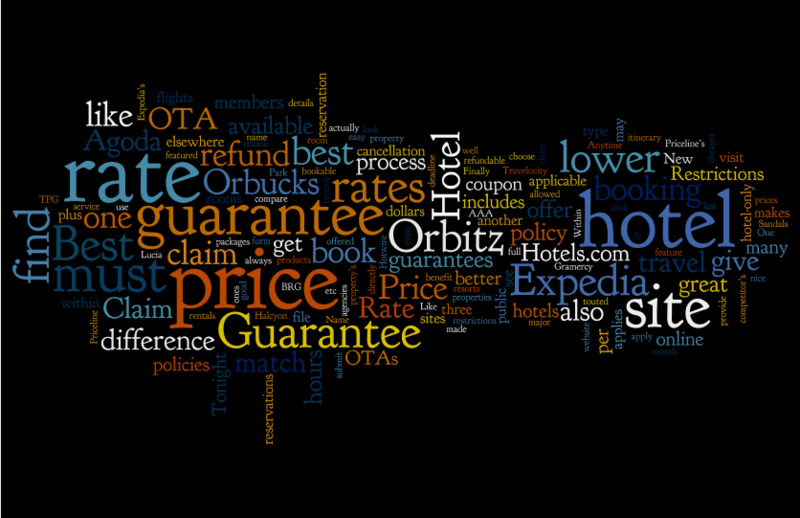 This word map came from a travel niche site's blog post about getting the best rates for hotels from online travel agencies. Go to any popular press release site and search for a phrase that’s popular among your niche audience. The results of this search are two-fold: you’ll be able to uncover what’s new that’s going on in your niche industry, and you’ll be able to see what web PR experts in your niche deem asrankable keywords for the search engines to pick up on. Because no one regularly goes to these PR sites for the simple joy of it, smart PR reps posting articles there know they have to optimize their text for keyword ranking (tweet this) to get the news in front of the eyes of their target audience. 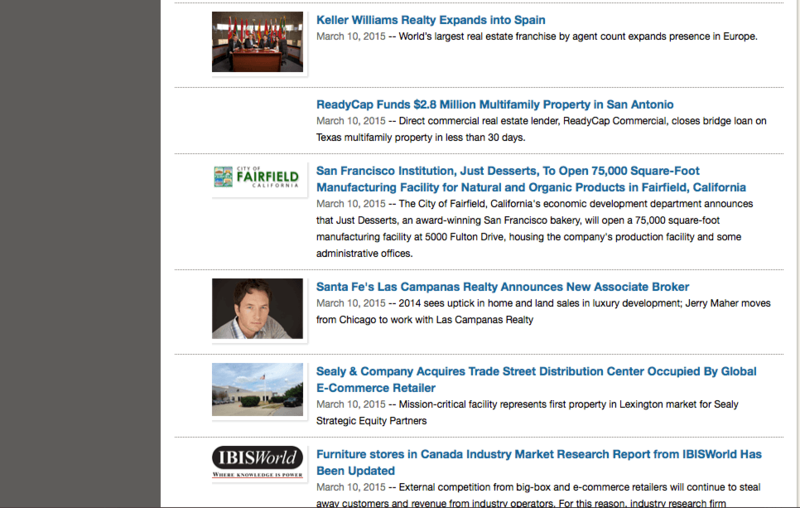 A search for 'real estate' on PRWeb reveals keywords like real estate franchise, direct commercial real estate lender, multifamily property, manufacturing facility, administrative offices, and ecommerce retailers. More keywords could be uncovered by following the links most relevant to your audience. MetaGlossary’s tagline above their search bar is “find meaning, not just links.” The only catch is, it works as more of a dictionary for one-word queries, rather than a long-tail keyword phrase. 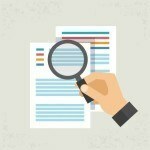 When you do a search, it renders a list of similar single-word keywords and a list of related terms that can really help you expand your current list of long-tail keywords by adding those related terms to your original word or brainstorm searches around them that you can produce content for. 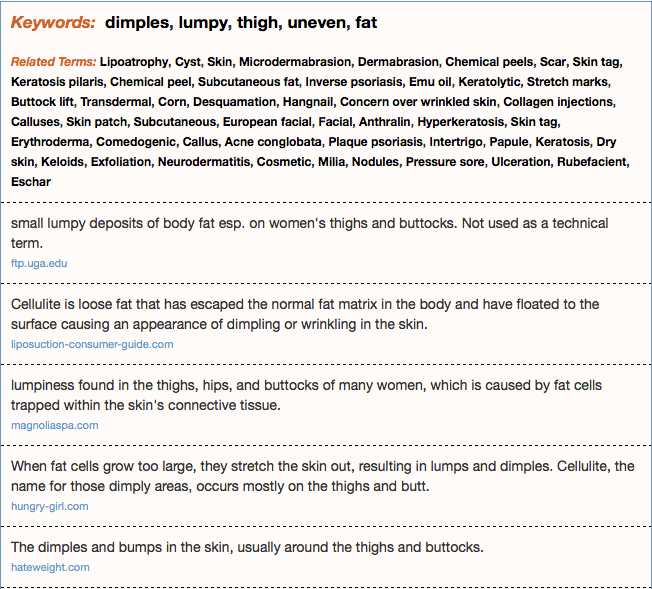 When I searched for 'cellulite' in MetaGlossary, I came up with a goldmine of keywords a niche marketer could use for their SEO content and ad campaigns. The related terms are especially interesting because they give you a broader perspective of services you can advertise or market for. Yes, cracking open a book (or, you know, an electronic version of one) can provide a new perspective on alternative thought patterns people might have when they’re searching online for a solution you offer. For example, not everyone calls a coffee maker a coffee maker. To some people, it’s a coffee pot, a Keurig, or a Mr. Coffee. This is a simplistic example, but you get the idea. 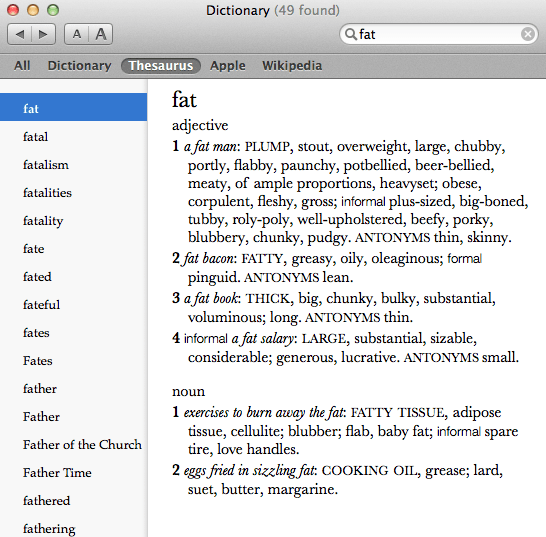 Continuing with the cellulite example from MetaGlossary, 'fat' is a related term that you'd want to explore. A term like adipose tissue could open your website's SEO reach to more medically-minded readers. A lot like Google’s Auto-Complete function, Amazon’s Auto-Fill guesses what you want to look for and buy based on what you’ve searched for before and the words you’re typing into a box. If you want a totally fresh look at it, log out of your Amazon account and use the search bar as if you were a totally new visitor. Even if you don’t sell physical products, you can still get ideas for longer-tail, purchase-ready keywords people use when they’re looking for information—one of the great things about Amazon is that it’s a major book seller that deals out loads of information on a daily basis in every niche market you can think of. If you have a niche site focused on helping people increase their incomes, you can see the information they're looking for on Amazon has a little bit to do with investing and the stock market, and a lot to do with being self employed while working online. If you’re wanting to establish yourself as a leader in your niche market, you should already be participating in discussions on leading blogs, forums, or the more modernized version of it all: Twitter chats. Even though the recurring themes and long-tail keywords here might not be buy-based, they are good for creating lead-in, researched-based conversational content, and give you a clue on some topics that are hot at the moment. This personal finance form reveals keywords like renting, Roth IRA, pension contributions, mutual funds, health savings account, mortgage, investing, and life insurance. Rather than doing all the mind-numbing work of figuring out all the different search possibilities someone could search for and writing down the results by playing with Google Auto-Complete, you can type one term into Ubersuggest and instantly get a long list of the top online searches related to your keyword. For example, I typed in ‘personal finance’ and Ubersuggest gave back to me a list of 10 of the top phrases with “personal finance” in them, 10 of the top phrases with ‘personal finance’ plus another word… and then it goes through the entire alphabet. 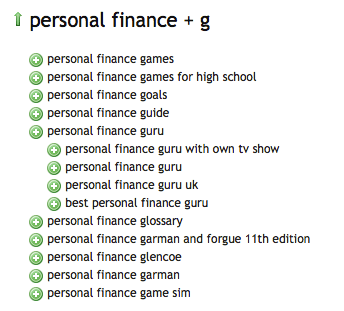 It gives you ten of the most popular long tail keywords with ‘personal finance’ with a word starting with the letter A, then B, then C, and so on. And then it does numbers 0-9… pretty comprehensive. And for any of the terms you want to know more you, you can click for four more related terms. As you can see, Ubersuggest goes into great detail with long-tail keywords, unveiling more possibilities than you could ever hope to use. Soolve is an interesting tool in that it shows you the top searches related to the words you enter across Wikipedia, Google, Amazon, Answers, YouTube, Bing and Yahoo simultaneously. Landing on Soolve, you get a blank page, but the instant you type a letter in, you start getting results. This can be a good way to make sure you haven’t left any keywords out, or figuring out how to allocate your advertising budget across different search channels. This is the Soolve screen before you start typing in any keywords. 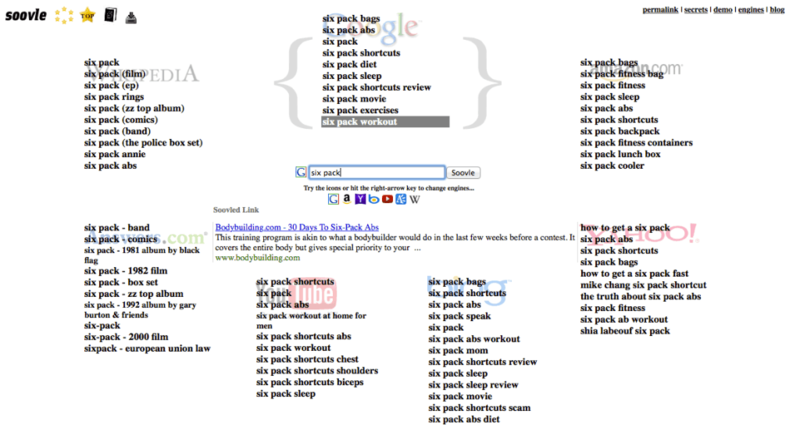 After you type in a keyword (in this case, 'six pack') solve gives you the top keywords from each of the different search engines they have listed. If you’ve got a full-fledged niche website that gathers traffic from paid ads, SEM Rush can be a great way to make sure you’re not letting your competitors get away with ranking for keywords you’ve accidentally left out. Especially if you’re just breaking into ad strategies, you can enter one of your competitor’s urls and see what kind of organic and ad-based traffic they’re getting, and for which keywords. 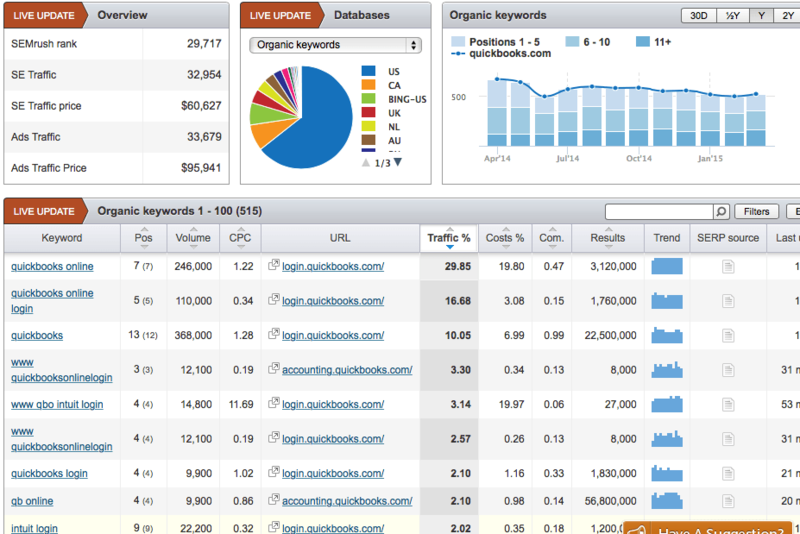 This is the QuickBooks.com organic traffic keywords report SEM Rush generates. 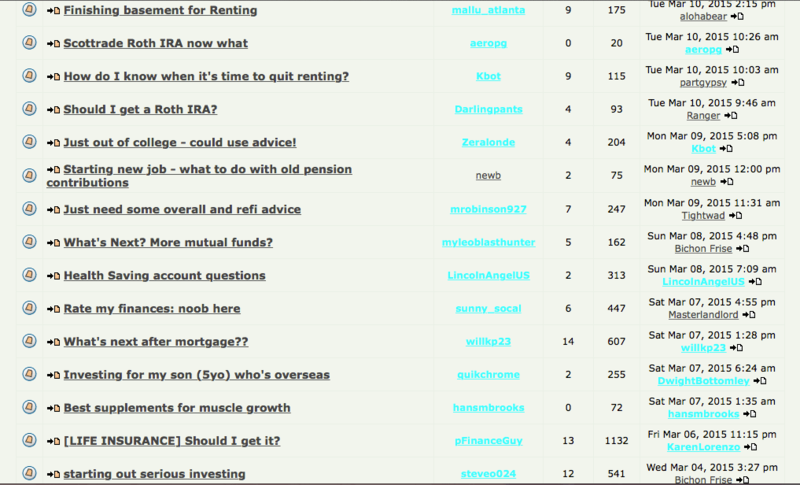 As you can see, it's a great tool to find out what your competitors are getting traffic from. This site gives you three free searches to do research on per day. It uses the auto-complete features of Google, Amazon and YouTube to to figure out the long-tail keywords most commonly used in search that are related to the terms you type in. When I typed 'vegan recipes' into the YouTube tool, I got a list of 42 relevant keywords I can use for building out my SEO strategy.